The full extent of the looting became clear years later, when some of the illegal excavators were arrested and confessed to police. The Lot 26 bracelet, they told police, was found in 1998, on top of a hoard of a thousand gold coins. To celebrate, the looters carved "Eureka" in the bark of a nearby tree—and kept digging. They showed no concern that they'd be caught: Another tree trunk bore an arrow and helpful directions: "Pits, 40 meters." A small team of treasure hunters hit the mother lode in May 2000, according to Romanian police. Their metal detector pinged over a stone slab about two feet wide, embedded in a steep hillside. 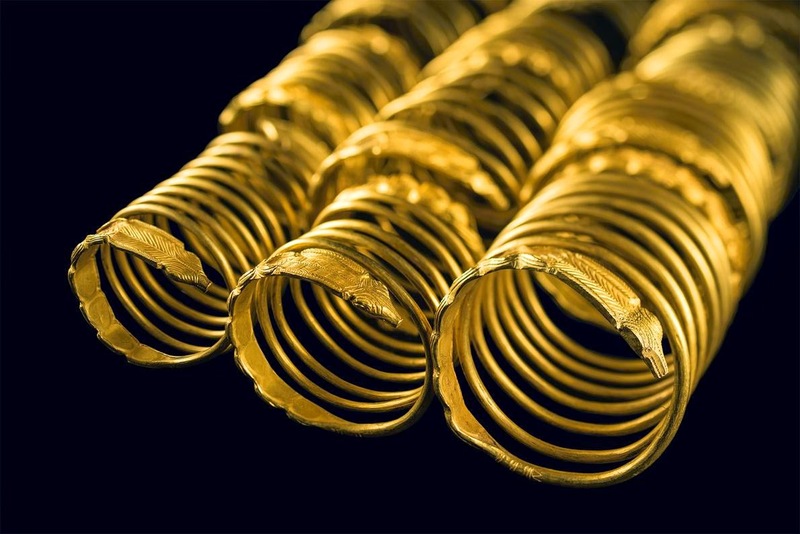 Underneath, in a small chamber made of flat stones propped against each other, they found ten spiraling, elaborately decorated Dacian bracelets—all solid gold. One weighed a hefty two and a half pounds (1.2 kilograms). You can read more of this interesting story at National Geographic. Thank you Catalin. I wish your country well in the people's effort to protect their environment. Did you ever notice how rural people in Eastern Europe are never farmers (as they are in Europe, North America, Latina America, Africa, East Asia etc) but peasants? "Let's meet on the corner at 60th and 60th"
Shopped at Radio Shack? Your data is for sale. Illustrations from "The Red Tree"
Scatman Crothers and other "character actors"
Your package has arrived !! A photograph of Mozart's widow? Why must members of Congress fly first class? A different red-blue split in the U.S.
What? You've never heard of a meat raffle?